Sydney Shop Girl: Complacency. Cooking. Chia Seeds. It has never been my intention to name and shame people for their beliefs in what I write in this blog. Which is why I'm starting my rant today with a photo of myself in first world problem mode. This photo was taken yesterday as I had to suffer through a morning of grey skies and rain in a comfortable part of suburban Sydney. I'd just survived a tortuous personal training session and then had to walk in the rain along a well maintained road where drivers were mainly observing the road rules and there was a conspicuous absence of guns, barbed wire or UN vehicles. I then had to buy a coffee at a cafe boasting an array of beans, milk and dairy alternatives as well as plentiful amounts of food. I sipped my coffee as I browsed a well stocked supermarket before settling down to read the paper and it was a this point that I found myself livid about my comfortable middle class life and the complacency it has inadvertently bred. One of the day's lead stories was about the poor immunisation rates in my local area. The actual story in the print copy of The Sydney Morning Herald featured a large photo of a mother with her two healthy children who didn't want to stress her little ones with too many injections and who also felt that the chances of them catching the diseases covered by the vaccine were so slight it really wasn't worth the risk. She is correct about the low risk of her children contracting the illnesses but I shan't bore you with the reasons as to why this is the case in Australia. As I mentioned at the beginning of this post, I'm not here to post images from that article and create yet another focus of ridicule and hate on the internet. 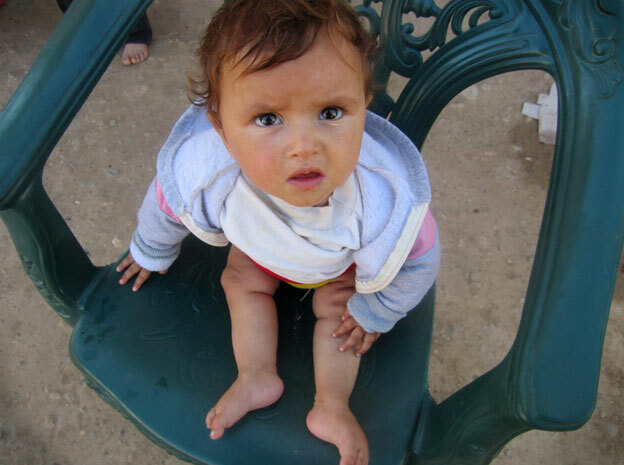 Instead, I have this photograph of a child in Syria with permanent paralysis of both their legs secondary to polio. A communicable disease largely eradicated in first world countries thanks to those 'evil and unnatural' vaccinations. This child is an innocent victim of the polio epidemic enveloping Syria as a consequence of the break down in all public health measures in that country secondary to political unrest and war. Do you think they have any chance of a remotely normal life in a country with virtually no functioning public health system? While it could be argued that much of what is going on in Parliament at the moment is ineffectual and inadequate, no one can deny one of the strengths of successive governments in Australia - a comprehensive public health policy that enables all Australians to have access to immunisation. Disease prevention is one of the greatest gifts a country's public health policy can give its citizens. Why on earth would you choose to refuse immunisations on behalf of another person when millions around the world are literally dying due to their being denied access to it? I'll stop venting my spleen now. I've obviously got too much time on my hands. Speaking of hands, I need to get myself to The Body Shop this weekend for new supplies of my favourite Hemp Hand Protector. I'm down to my last tube to replace the shrivelled thing currently sitting on my desk. I've been busy in the kitchen with two of Toddler SSG's favourite foods - cheese in all its glorious forms and Coles rotisserie chicken. I've calculated that you can get at least three different meals out of a chicken. There's eating it as is, then there's pasta bake and my new favourite, chicken and spinache quiche-y things. The best news is that all three are very toddler friendly. The recipe I've linked to is less egg-y than other recipes and to make up for the shortfall, it features three different types of cheese - cream, Parmesan and mozzarella. I found my frozen spinach at Aldi where it's 99 cents for a 250g box. All you need to do is combine the spinach layer ingredients (I used a hand held mixer) and place heaped teaspoonfuls of it over puff pastry cases with a little leftover cooked chicken in them. I got two dozen mini quiches out of the recipe. Be warned, they're very moreish. Yesterday afternoon passed in a blur of food prep which saw me come up with three different dishes in the course of a couple of hours. Inspired by a Donna Hay facebook post, I found myself making stove top lasagna using this kidspot recipe. Dry lasagna sheets! It's been ages since I've seen them. It was very therapeutic breaking up my eight dry lasagna sheets over the prepared sauce and then stirring the result every so often as it cooked on the stove. Twenty minutes later, I stirred through the cottage cheese and then let the mozzarella melt off the flame. Other versions of the recipe require you to put the whole pan under the grill and this would probably give you a nicer end result but I was feeling a bit lazy and hadn't had the foresight to use an oven friendly pan. Not the most styled lasagna photo out there but this is how my one pan, stove top lasagna turned out. It's a hearty and filling dinner, I like how there's a sort of bechamel sauce happening with the stirred in cheeses - all the taste without too much effort. Perfect for this cooler weather. We just had a green salad with it last night and there's three tubs in the freezer for later. I am now an official chia seed groupie. I reckon I'm only about 6 months behind everyone else but this is significant progress in my relationship with super foods. The last ones I embraced were cranberries and psyllium - both of which are around 20 years into their superfood life cycle and are thus practically part of standard dietary guidelines. There has been so much talk about chia seed puddings and breakfasts lately. Not only do they look delicious but I'd also heard rumours that you wouldn't even be depriving yourself in the taste stakes if you had a chia pudding rather than an almond croissant or wedge of chocolate mousse cake. I had no choice but to investigate. Chia pudding - simply measure, mix and refrigerate. Too easy. I bought my kilo jar of chia from Costco for $20 which isn't too bad considering the RRP is $30 according to The Chia Co website. The vanilla chia pudding recipe I followed yesterday is this one from A Beautiful Mess and requires a cup of coconut milk. It makes a very rich pudding, only a few tablespoons are enough for a rich and filling hit of decadence and healthiness (is it even possible that these two words can simulatneously describe something?). I added some maple syrup to my serve which gave it an earthy sweetness. Fresh fruit and chopped nuts are also meant to be perfect accompaniments to your chia pudding. I've found some other recipes that use almond milk so will try this next. Are you a late adopter when it comes to super foods? I love your little rant at the beginning. I am with you regarding immunisation. It alarms and angers me that so much misinformation is put out there. If there were an epidemic (and it could happen) those kids would be vulnerable. People must not take their health, and health care, for granted. Better out than in, regarding the rant, C! But seriously, it is one of those issues where misinformation seems to reign. Lauren, we must have been separated at birth!! Thank you for highlighting the anti-vax nonsense and providing some hard cold reality to the argument. I too cannot comprehend how some parents believe they are above public health measures (since when does any government shell out dollars for fun - they are always after maximum bang for minimal buck) and think their research defies cold hard scientific evidence. With you re governments and their spending, Mrs M! Thank you, M! Hope all is well with you. I never thought I'd be a chia lover, HIH but here I am! I am another one who is concerned about the anti-vax 'movement'. I understand we are all trying to live healthier lives, many of us are trying to incorporate organics into our diets, reduce the chemicals (I use that word in the traditionally understood context) we use and it seems vaccinations have been caught up in all of that. It doesn't help when you have idiotic celebrities bleating about how bad they are and how they've caused XYZ ailment to their child. My grandmother died when she contracted tetanus in the mid 1960s. My mum was only a teenager, their youngest sibling was only a few years old. I have never known a grandmother because she died of something we are fortunate enough to be protected against, especially in this country. I regularly donate to UNICEF and often do it by way of purchasing the various vaccines that they distribute to underdeveloped nations because those parents (and children) could only wish to find themselves in the circumstances that would even allow them to ponder whether vaccination was necessary. I like the UNICEF donation idea, OP.